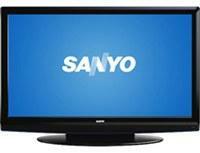 (without stand or speakers) 41.5" x 26.8" x 4.3"
SANYO 42" Diagonal Wide Screen (16:9) High Definition Model DP42740 HDTV Plasma with integrated ATSC Digital and NTSC Analog Tuner is the latest technology for the digital age. In a High Gloss Black finish it blends into the background when the lights are dimmed for your movies, sports and favorite programs in your den or living room. Having a full array of HDMI, Component Audio/Video, Composite Audio/Video and RF inputs, you have plenty of options for DVD, VCR, Cable, Satellite and external antenna hookups. A digital coaxial audio output allows hookup to a home entertainment receiver amplifier system for theater like sound. The new USB input and Photo Viewer feature allows display of your digital camera photos for all to easily see.With a thin space saving design and small footprint, it can be positioned anywhere. The detachable pedestal base stand allows it to be wall mounted with an optional wall mount kit (not included).